The fitness industry is obsessed with numbers. Everywhere we look success is given a numerical value. This can be observed in many forms; it could be the amount of weight lifted, or the number of reps completed, perhaps the amount of weight lifted in correlation with body weight. It could be the time it took you complete a given challenge or the distance you covered in a set time. Training is evaluated and programmes created using percentages and formulas. In certain circumstance such as some of the above this is no bad thing, in fact quite the opposite. These numbers do a very good job of putting a very abstract concept in coherent linear terms. However, the obsession with numbers is more prominent in one particular area and in this specific area it is; in most cases a hindrance. Chances are if you talk to someone regarding fat loss it won’t take long for the conversation to turn to those numbers again. Calories, number of weeks trained, number of pounds lost, inches gained, clothes shrunk and so on and so and so on its a never ending vicious circle. You might think that because your obsessing over these things your ‘on it’ but your probably making things a lot more difficult than they need to be and in reality your not seeing the bigger picture. 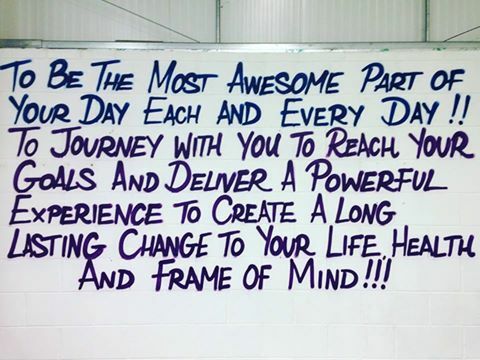 Bellow is a picture of our mission statement which takes pride of place on one of the walls in the gym, Now, correct me if I’m wrong but I’m almost certain the key aspects of it such as enjoyment, health and mindset can not be represented by numbers nor can they be measured. So, what is the whole point of all this? To put it into context when we devised our mission statement we took into account the things we value most here at RT fitness. We took the time to think ‘what do we really want people to judge their experience here on? When people look back on their time here what will they think, feel, value? In the end we came to a conclusion that the things that matter most can’t be measured. They can’t be given a numerical value. They are entirely individual and those are the things that will help create the positive lifestyle changes we promote. The best ways to evaluate yourself should be how feel, how happy you are, your energy levels, how much your relationships have improved, the friendships you have built and the fun you have had. These are things that actually matter and only you can feel and judge them. It’s important that we learn to relax and enjoy the journey. If you get the important things right the little things such as a slightly smaller waistline will follow but that shouldn’t be your be all and end all. It will be the result of positive steps in all of the areas above. Please, stop measuring your success with numbers. Learn to think In bigger terms because life really is to short.